Because I am still a bit under the weather (thought I was better, turns out not so much), I am not attending ISU's production of Tom Stoppard's "Rock 'n' Roll" tonight to review it. So I decided I will do a preview instead, and then try to get there next week for a proper review. 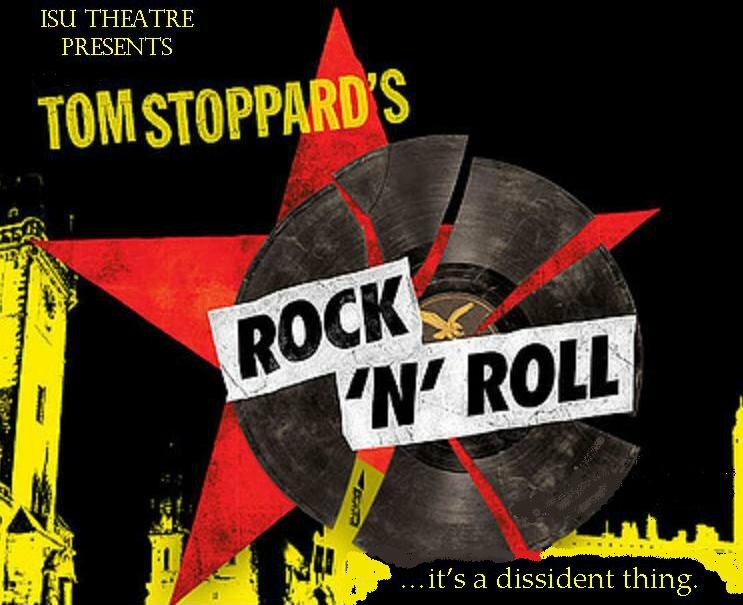 "Rock 'n' Roll" deals with Stoppard's native Czechoslovakia as well as his adopted home, England, in the 60s, 70s, 80s and 90s, contrasting a Czech grad student with his British professor. The former is a major fan of rock 'n' roll, so when he returns to Czechoslovakia after the Soviets try to quash reform in 1968, all he takes are his vinyl Rolling Stones and Pink Floyd LPs. And the latter is an unrepentant Socialist and Marxist, who has a very different opinion of the Soviets than his Czech student. He also has a wife, who is very ill, but still determined to be who she is and think what she thinks. The play is a rich mixture of politics and ideas, music and philosophy, revolution and freedom, poetry and personality. "Rock 'n' Roll" enjoyed a successful production directed by Trevor Nunn in London in 2006, with Rufus Sewell as Jan, the student, Brian Cox as his professor and Sinéad Cusack as the professor's wife, who is as enamored of classical Greek poetry as her husband is of Marx. Those three reprised their roles on Broadway in 2007, while Timothy Edward Kane, Stephen Yoakam and Mary Beth Fisher played them for the Goodman Theatre in Chicago two years ago. James Wagoner directs "Rock 'n' Roll" for ISU, with Tommy Malouf, Mitch Conti and Brynne Barnard in the pivotal roles. The show opens tonight in ISU's Center for the Performing Arts, with performances April 1-2 and 6-9 at 7:30 pm and April 3 at 2 pm. For more information or to order tickets, you can phone 438-2535 or visit this page. Note: This piece originally misidentified the actor playing Max in the ISU production. I corrected it after being notified by a commenter. Just so you are aware, the role of Max, originally planned to be played by Mike Gamache, is being played by undergraduate acting student Mitch Conti. Thanks for letting me know, Anon. I'm hoping to get to the show this week. It is a bit distasteful to comment on the casting of the play as if to imply that the actor playing the part is somehow inferior. I had a wonderful experience with this play! Great cast!